AS is said, like father like son. Now, if ones father is a stand up guy – whether a rich man, poor man, or somewhere in between – this is a man a son should strive to emulate. On the other hand, when a son has a father who is less than honorable – in ways that would make a whore blush – it is time to look for a new role model! ALAS, imagine, in your mind’s eye, the Islamist-in-Chief opining: “If I had a son, he’d look/act like Ahmed.” Indeed, Trayvon redux. WHICH brings us to the recent kerfuffle, regarding the 14 year old Muslim who caught the White House’s eye – what a shock – even while there are so many national/international fires raging. Hmm. HUSSEIN Obama has the time for a “sit down” with an “offended” 14 year old! Credo quia absurdum. 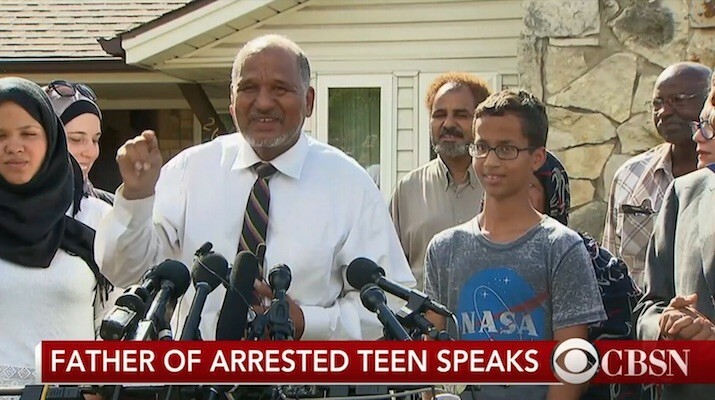 Obama doesn’t have time to recognize the cop killings everywhere, but he definitely has time for a Muslim teen who got arrested for administrators thinking that the homemade clock he brought to school looked like a bomb. The Muslim teenager arrested for bringing his home-made clock into school which teachers claimed ‘looked like a bomb’ has said he will go to the White House to visit Barack Obama after the President extended an invite to him earlier in the day. 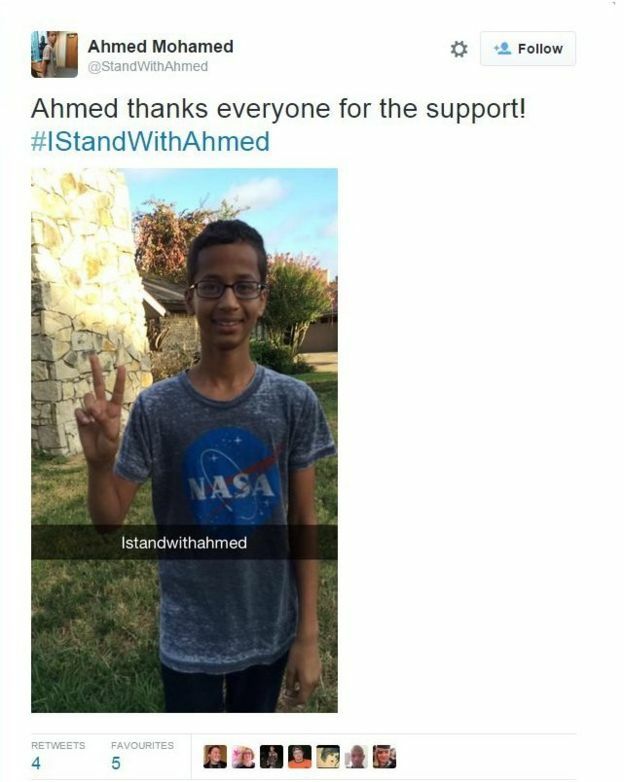 Ahmed Mohamed, 14, received messages of support from across the globe today after an image of him being handcuffed and escorted out of MacArthur High School, in Irving, Texas, went viral. Speaking at a press conference on CBS, Ahmed also thanked Obama, Democrat Presidential hopeful Hillary Clinton and Facebook founder Mark Zuckerberg for their messages of support, saying he is ‘pleased’ they oppose what happened to him. 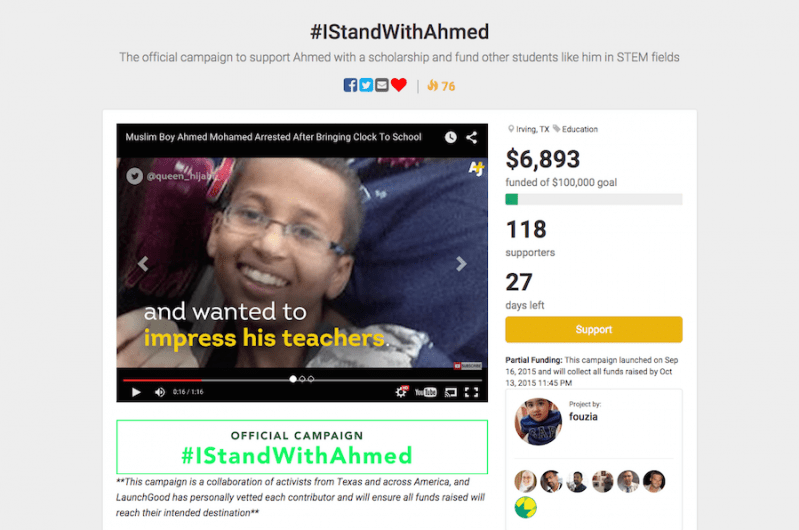 TO wit, the question becomes: What really went down with Ahmed and his “project”, in so far as it is becoming increasingly clear that this whole saga was staged as a put-up job? A propaganda heist, if you will. 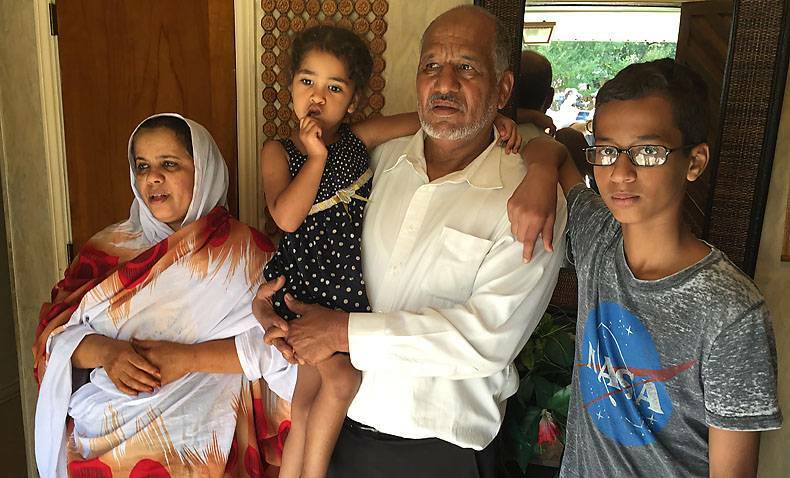 In addition,it has been noted that Mohamed’s father, Mohamed ElHassan Mohamed, is a known activist who has engaged in several stunts to call out what he has perceived to be anti-Islamic activity. Mohamed himself has even implied in a YouTube video that he knew that the clock he had built looked suspicious and threatening. 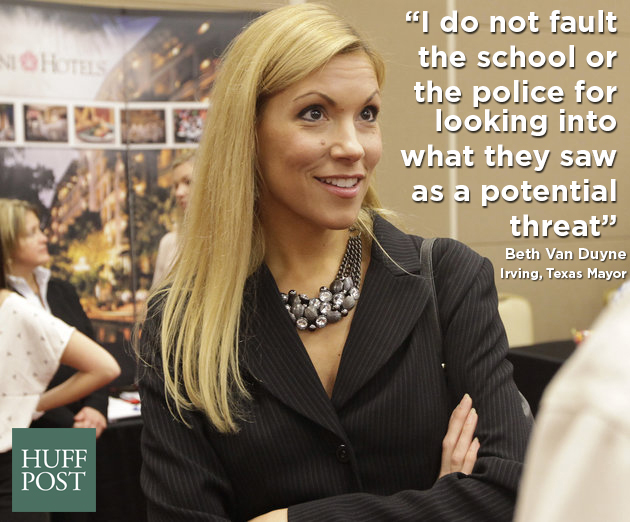 “I closed [the ‘clock’] with a cable, I didn’t want to lock it to make it seem like a threat. 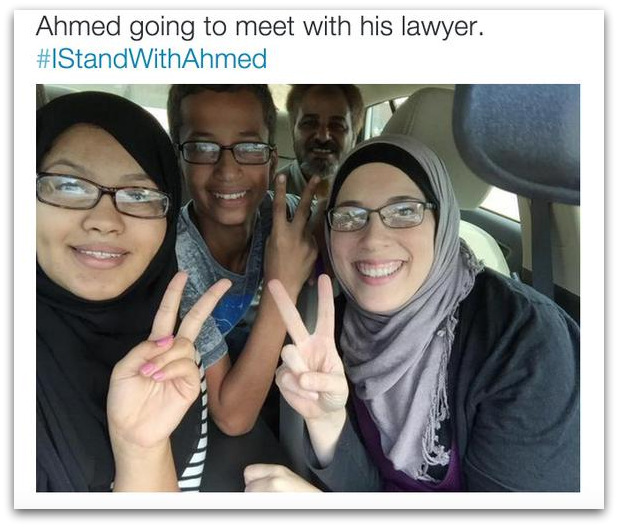 So I just used a simple cable so it won’t look that much suspicious.” Ahmed stated. 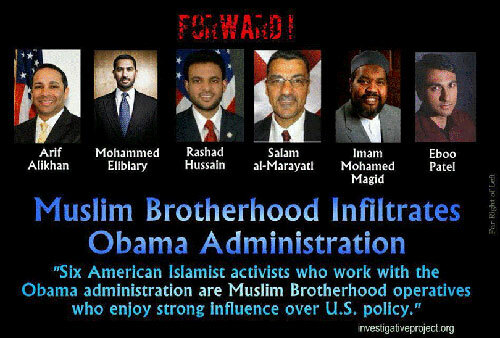 Yes, right up Obama Inc.’s (Brotherhood-infested) alley. NOW, the so-called budding scientist is nothing of the sort. Mind you, there is no claim on this end to being an electronics expert (that’s an understatement, in reality, a hoot), but there are others who are. In fact, here is some of their expert diagnoses via requisite due diligence: Looks like the Whole Little Ahmed Mohamed Clock Deal May Be A Fraud! 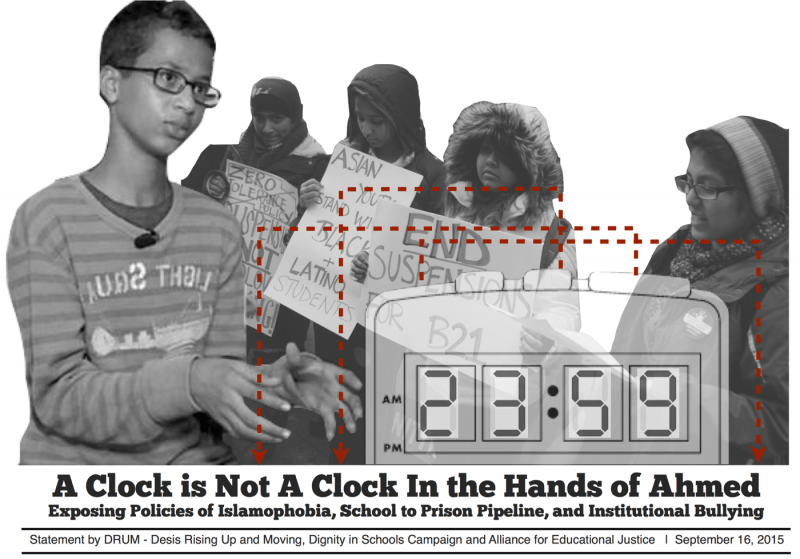 Not only that, but it is further asserted: Muslim boy’s “cool clock” is a fraud, says expert! The most famous clock in America is a “fraud,” according to an electronics expert who says 14-year-old Ahmed Mohamed did not invent anything and simply took a commercial clock out of its manufactured case…..
“Cool clock, Ahmed. Want to bring it to the White House? We should inspire more kids like you to like science. It’s what makes America great,” tweeted Obama. 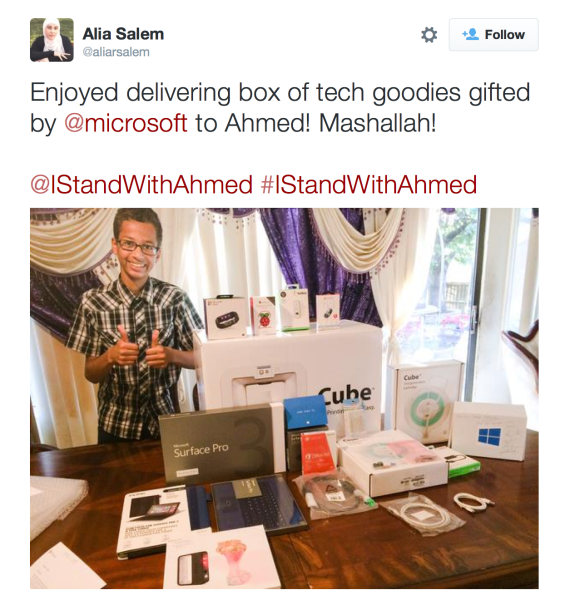 Mohamed also received invitations to meet Facebook CEO Mark Zuckerberg and go to NASA and MIT. Twitter has offered him an internship. TV hosts Stephen Colbert and Ellen DenGeneres have called him. But is the whole invention a sham? In a YouTube video that received hundreds of thousands of views in just the first 24 hours, electrical expert Thomas Talbot dissects (click on link) a photo of Mohamed’s clock. EVEN more so, shouldn’t Ahmed be re-arrested for perpetrating what is clearly a “Islamophobia” hoax, scaring the daylights out of the school to begin with?? 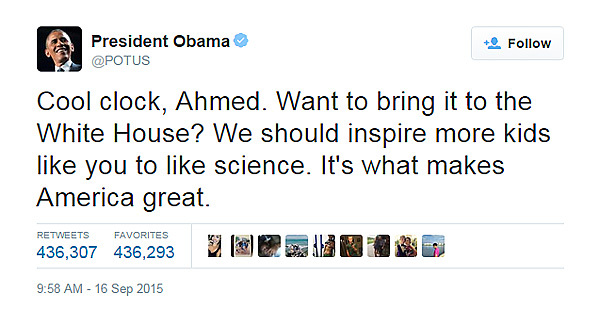 Little Ahmed, the so-called Muslim boy ‘genius,’ didn’t invent anything, didn’t even build anything. He took apart an existing clock, and transplanted the guts into a pencil box, and claimed it was his own creation. Nobody said Mohammed built an actual bomb. They suspected that he had wanted to frighten or alarm officials with a hoax-bomb. 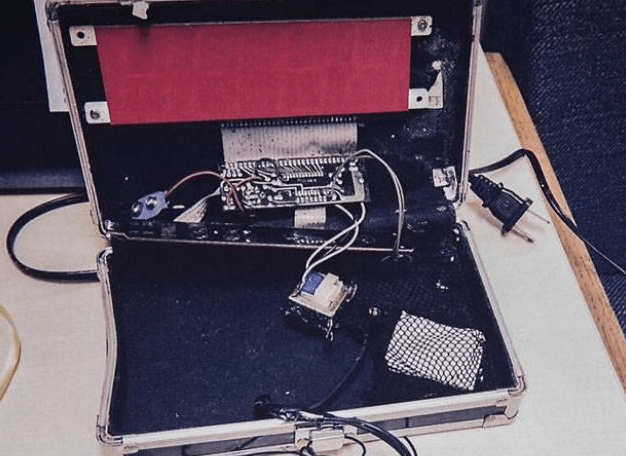 The police said that initially, it was “not immediately evident” that the clock-in-a-case was a class experiment – perfectly plausible, given that Mohammed built the clock-in-a-case voluntarily, without assignment, and in conjunction with no science fair. Chief Larry Boyd said simply and correctly, “You can’t take things like that to school” without explanation or assignment in today’s world without it receiving scrutiny. And according to the cops, Ahmed was significantly more cooperative with friendly media than with the police who came to ask some simple questions. Now, let’s look at Ahmed’s father, Mohamed Elhassan Mohamed, a millionaire, social justice activist, and potential tax fraud. Mohamed Elhassan Mohamed, has a lengthy history as a troll and publicity hound. But that’s too negative. He is also a sophisticated and intelligent man., who started from the bottom and worked his way up to the top, ultimately selling his taxi cab company for millions of dollars. His success will somehow be used to show how unwelcoming America is to Muslim immigrants. Yet that’s not all Mohamed Elhassan Mohamed has done. Mr. Elhassan Mohamed is a political activist who also trolls for attention. He has made two unsuccessful runs for the president of the Sudan. And as Ian Tuttle of National Review has pointed out, America has become extra-paranoid of late: students have been suspended for gun-shaped Pop Tarts, cap guns, finger guns, and saying the word gun, among other grave offenses. And we don’t even need weapons to suspend students anymore: wearing an American flag at the wrong time or donning a Confederate flag t-shirt will do it. So why, after the detention and release, did this story become a national one? Why did Obama jump on this story? Why did Hillary jump on this story? Where were they for then-16-year-old Kiera Wilmot of Florida to the White House after she was arrested and suspended in 2013 for bringing an experiment with toilet cleaner and aluminum foil to school? She was black but not Muslim, so it didn’t serve the narrative. They were MIA. For years, the Obama administration has pushed the notion that American Muslims are in danger of Islamophobic backlash. But as of 2012, 62.4 percent of all anti-religious hate crimes targeted Jews; 11.6 percent targeted Muslims; as of 2013, anti-Jewish hate crimes represented 60.3 percent of all hate crimes, as opposed to just 13.7 percent for Muslims. That’s a major decline in anti-Islamic hate crimes since 2001, when 55.7 percent of hate crimes were anti-Jewish, and anti-Muslim hate crimes constituted 27.2 percent of all hate crimes. So where, exactly, are all the invitations to Jewish students targeted in hate crime incidents? They don’t exist, because they don’t help President Obama castigate America as xenophobic and backwards – and just as importantly, castigate Texans as particularly likely to don white hoods and go hunt down some Sufis. Ahmed was a puppet (his sister was feeding him answers). 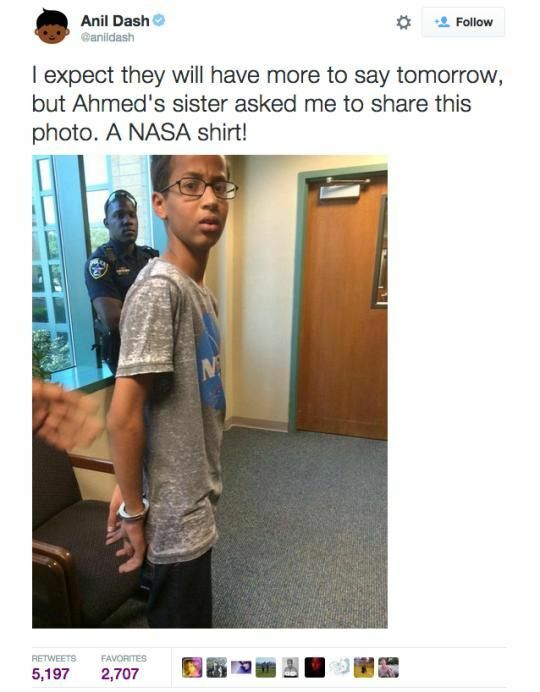 Ahmed showed the “clock” to every teacher until he finally got the desired response. This was a troll job/hoax. INHERENTLY, it is not for nothing that CAIR is inexorably in this site’s cross hairs, knowing full well that it was established as the Brotherhood Mafia’s propaganda arm. IS it any wonder that they are also front and center in spearheading the uproar against Dr. Ben Carson, for having the “temerity” to state: A Muslim shouldn’t be POTUS! MIND you, an ex Islamist agrees with the fact that a Muslim shouldn’t be POTUS! BOTTOM LINE: In the same manner in which there are laws against screaming fire in a crowded theater, so too there should be laws (after all, is it still America, or the Shariah States of America?) against those who incite against “bigoted” America in order to facilitate stealth jihad! Where is the nexus? It revolves around the ability of dedicated Islamists to fly below the (communal/national) radar, but only until the Islamic community is strong enough – both politically, economically and otherwise – to emerge from the shadows. Operating out of full view affords anonymity, yet allows jihadists to build up as many war chests as possible. Two key components are monetary bases and hidden terror cells. They must be ready and prepared to spring into frontal action, if necessary. As a matter of record, staying burrowed for years is often a requirement. As is said, “hiding in plain sight” is more than a saying to Islamists. It is an actual method of jihad! But if one example stands out among countless others, look no further than to a recent commentary, which commemorates the 12th memorial of 9/11/01. The DESECRATION of 9/11/01: Stealth Jihad” Via Mosques; Adnan Oktar’s Turkish-Islamic Union, Taqiyya”, Penetrates Into Jewish/Israeli Media/Power Centers – Where Is The Nexus? demonstrates the despicable and dangerous lengths the Muslim Brotherhood pursues to effectuate their agenda. The submission (Islam literally means “to submit”) of the west to Shariah Law, as described in just one of many YouTube interviews with Islamic leaders, is anything, but circumspect, despite their usage of Stealth Jihad. So, while the Muslim Brotherhood utilizes a mix of Stealth Jihad – in combination with “frontal/open jihad” – for this discussion, let us stick to what is less visible, than what is more readily apparent, that is, exploding body parts…. MOST significantly, softening up the public – to “prove” that Muslims are “victims” of “Islamophobia” – allows them to stealthily manipulate public opinion, as well as the legal system. And, this is where CAIR, its propaganda arm, always jumps in. Their raison d’etre. IN the main, the end goal is to implement Shariah Law. If that sounds too fantastical, so be it. However, the fact remains that they have been wildly successful, so much so that the Brotherhood Mafia’s Plan is ahead of schedule. Almost a done deal. Believe it – or not. NOW, isn’t that exactly how it went down, as if from an Islamist play-by-play book? This entry was posted in Uncategorized and tagged Agenda21Radio, CAIR, CowboyLogic.us, DC WATCHDOG, DonnaFiducia.us, electrical expert Thomas Talbot, Islam Exposed, Islamophobia, Joe For America, Mohamed Elhassan Mohamed, Muslim boy's "cool clock" is a fraud, propaganda heist, so-called Muslim boy ‘genius', stealth jihad, The Homeland Security Network by Adina Kutnicki. Bookmark the permalink. Most Muslims are liars, and will sue for anything! These Islamic groups all have terrorist ties! Get rid of these scum, make America beautiful agian! Pingback: Israel's Voice | ISIS’S REDLANDS TARGET: ”INFIDEL” CHRISTMAS. The West Vs. Islam’s Quranic “Holy” Jihad! Follow Anaheim, CA Template, CAIR Be Damned.